This fabulous Italian needlework trousseau bed sheet dating from the early 1900’s, is home sewn of wonderful soft cotton sheeting material. 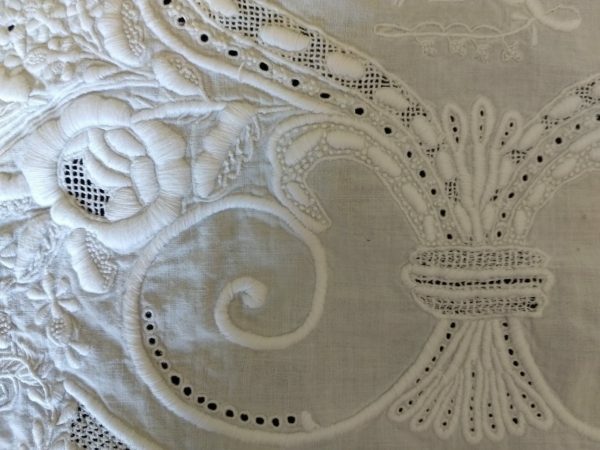 Now, the workmanship of the needlework makes this sheet truly outstanding ~ the raised flowers and padded stitches are so impressive ~ intermingled with tiny candlewicking embellishing the small flowers ~ to the delicate drawn thread of the open work. It is made of three width of fabric, each 30″ wide with flat felled seams. Over all size of the sheet is 98″ long x 90″ wide. It features hemstitching border, including a 24″ sheet return.